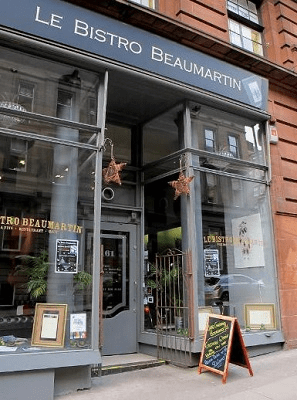 Strathclyde’s Language Ambassadors met with school pupils at a local French restaurant last month, to encourage them to study a language at University. The group met at Bistro Beaumartin where pupils from Renfrew High, enjoyed a French taster session, on 17 November. Pupils studying Higher French attended the event, with the aim of informing them of the benefits of studying a language at University, but also easing any worries about the transition from secondary school to University. The Language Ambassadors scheme has been running for several years and every year the ambassadors carry out several visits to schools in order to promote languages as well as informing secondary school pupils about the benefits of taking a language as a Higher or even carrying it on to University level. The visits usually take place in schools but the visit to Bistro Beaumartin created an informal session where the Ambassadors could chat freely and informally with pupils whilst also sampling fine French Cuisine.